I created an Igbo Calendar Widget and a Market day finder as a wordpress plugin, the plugin isn’t public, it can only be found being used here http://igbocalendar.com/igbo-calendar/view-igbo-calendar-for-this-year/. The Calendar widget and Market day finder supports years starting from 0001 A.D. to 8064 A.D. and beyond. 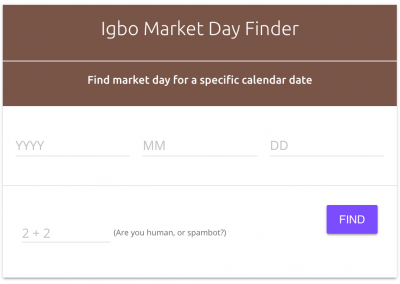 You can use it to find the corresponding Igbo Market day for any Gregorian Calendar date.